I have been in Maryville for nearly one year. I started July 29th of last year. As some of you know by my tweets/facebook posts, it has been positive in many regards. One includes seeing my parents more. I attended a funeral today for a friend’s mother who passed away last Tuesday. She was 69. As I was sitting in the service, I couldn’t help but think about all my friends who have lost either one or both of their parents. I am very blessed to have both of my parents alive and in good health. Some of you are probably thinking how I could see my parents MORE by living 140 miles away from my hometown of Des Moines. But it is true. I freely admit I took my parents for granted by living in the same city as them for virtually my entire life. I get to Des Moines a lot during the weekends despite living in Maryville, Missouri and I always see them when I go into town. It’s true that you appreciate the people who you are close to more after not being around them. They helped me move along with my brother Seth, are my biggest “fan” and supporter in everything that I do. If you have lost one or both of your parents, I want to let you know that I was thinking of you today. Last week I logged 732 miles on my car. Traveled all over Northwest Missouri to call high school basketball. Monday, Tuesday and Thursday from Maryville to Lathrop and back. Wednesday and Friday from Maryville to Mound City and back. Saturday from Maryville to Eagleville and back. I’m becoming well acquainted with the highways here. I’ll admit driving so much is kind of a drag, but it’s part of the job. And I get to do something I love, call basketball games. Monday, Tuesday and Thursday I followed the Maryville girls and boys. Monday the girls lost to Lathrop to end their season. Tuesday the boys beat Cameron but lost to Lawson Thursday to end their season. It was a rough year for Maryville. Both teams won a combined 10 games. 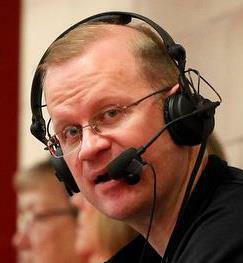 Wednesday and Friday I called the Nodaway-Holt girls games. The Trojans are currently undefeated at 26-0 after winning their district and are ranked #1 in Missouri Class 1. They feature Megan Rosenbohm who has comitted to play for Division II Southwest Baptist in the MIAA (Same league as Maryville’s Northwest Missouri State). Nodaway-Holt plays Mercer (26-1) tomorrow night for a trip to the state quarterfinals. Saturday I made the trek to Eagleville to call the Stanberry vs Jefferson (Conception Junction) Boys District Championship. Stanberry came out on top and they moved to 24-1 with the win. They meet Rock Port tomorrow night, also for a birth to the quarterfinals. I’ll be traveling to St Joseph (80+ mile round trip from Maryville) tomorrow night to call both above mentioned games. I’ll be heading back there on Saturday for the quarterfinal round also. The Missouri State Championships are next week in Columbia. Unlike my home state of Iowa, they do a “Final Four” format. And it runs Thursday to Saturday. I am planning on making the trip, figuring at least one of the teams I am following will make it to either the old Hearnes Center or the more modern Mizzou Arena. I’ll get a week off before the Maryville baseball season. First game is scheduled for the 25th. Excited for the baseball season in general and getting back to “The K” to see my Royals again. I’m in my 4th week at my new job in Maryville. I was just sitting here today thinking about how my tension level is virtually zero. I felt quite a bit from the time of the initial call I received from my current boss when he offered the job to the point of my first day. Yet that sort of tension is only natural, I’m sure you’d agree. Changing jobs/moving is stressful. But I have settled in greatly here. Looking forward to what my future brings. But the real point I want to make is going into work every morning feeling no stress. I haven’t felt that way since the early days at KXnO Radio in Des Moines. Without going into details, my last two Monday-Friday stops in radio weren’t ideal. The supervisors I had there micro-managed me and quite frankly didn’t trust me to do the job in my opinion. I don’t react very well when being micro-managed. It affects my job performance. I am so blessed to be here. I’ve probably bored you all to death by telling you how happy I am. But it’s the truth. I’m not ashamed to admit I was dead wrong about the initial thoughts I had about coming here. Working in corporate radio is not all you might think it is. There is something to be said for local radio mom and pops who work hard in a small business format to be a public service to their community. I am pleased that I can be a part of that in Maryville. I truly feel respected and trusted now. You can’t imagine how great that feels. Sometime down the line in a later blog, I’ll write about how everything came into place for me here after I said “yes” to the job offer of Jim and Joyce Cronin. I just completed my 2nd week, 1st full week at the new job here in Maryville, MO with Nodaway Broadcasting (97.1 The Vill and 95.9/1580 KNIM). Last week I attended a little news conference with Missouri Governor Jay Nixon who visited regarding a veto he made on a tax for prescription drugs. Got a chance to meet a few city officials there. This week I had a one hour sit down with Nodaway County Prosecutor Robert Rice. Just kind of a “get to know you session.” Very friendly guy. In fact, everyone here has been friendly and welcoming. I had my first extended on air appearance last night. I interviewed a few 8 man high school football coaches for a series we are doing called “Fan Camp.” I’ve got more of those the next two Fridays before the season kicks off on August 30th. This is something I needed. Moving out of Iowa. It’s been home all my life, but change has been good for me. I don’t think I fully saw that until after I got settled here last Saturday after my move. By the way, thanks to Mom, Dad and my brother Seth for helping me with that. Moving isn’t usually fun, but as the four of us sat down for some pizza to end the day, mom said she “had fun.” It was more about us just being together. I always appreciate time with my family. Even if it includes moving a few heavy things. Jim and Joyce Cronin (the owners) have been very good to me already. Case in point. My travel expenses. Jim had a check for me the same day after I submitted a receipt for the truck and gas charges. I’ve worked in corporate radio most of my life and normally you wouldn’t see a check for a few weeks at best. They also took me out to lunch after my first day on the job a week ago Tuesday. My duties include working with Jim on the morning show (97.1 The Vill). I do twice hourly news/sports updates from 6a-8:35a. I also record news/sports for 95.9/1580 KNIM that plays throughout the day. If you want to check me out, you can at either nodawaybroadcasting.com or by searching K V V L on the TUNEIN App. My “Fan Camp” interviews are posted on the website. Under the Sports Tab, click on FAN CAMP. If that little voice in your head is discouraging you from picking up and getting out of your comfort zone, resist it. Leave. It’s a good thing. Oh and perks. Going to see my Royals tonight and Sunday. Tonight I’m gonna hang out with my old broadcasting partner Larry Cotlar. He and his wife and step son are in KC now. How great is it that I am this close to Kauffman Stadium the first year they are playing well in years? See! God just might bless you in a mysterious way by doing what he asks! 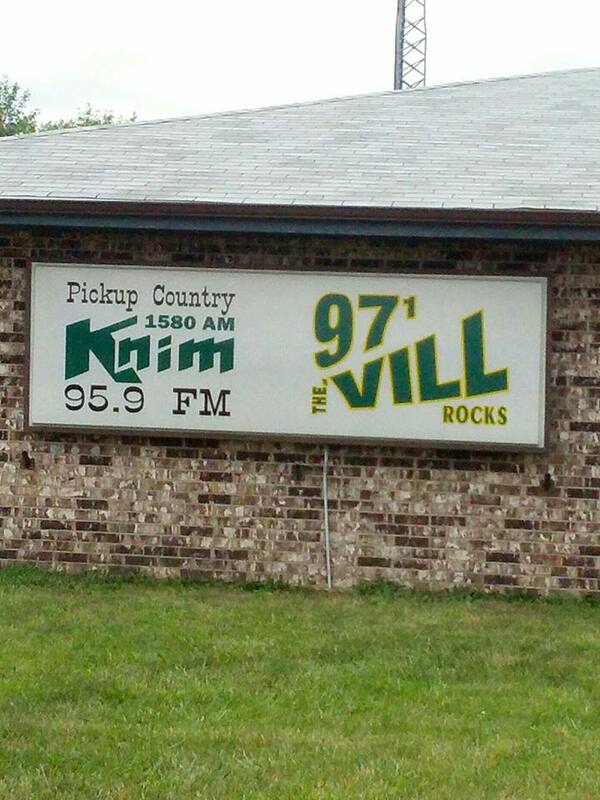 I have acccepted a full-time radio news/sports job in Maryville, MO with 97.1 KVVL and 1580 KNIM. Will be starting at the end of the month. This all came about pretty quickly. 2 weeks ago I got an unsolicited phone call from Jim Cronin with Nodaway Broadcasting in Maryville. He told me that he got a referral from a job service I subscribe to (Sportscasters Talent Agency of America -OR- STAA). Asked me if I was interested, I said sure. Went down last weekend for an interview with the husband/wife team who run the stations. Spoke with each of them last Sunday. They put me up in a hotel to stay overnight to talk with the rest of the staff Monday morning. Got a call back Tuesday and they offered. I accepted on Thursday. I’ll be working with Jim on the morning show. KVVL (Known as THE VILLE) plays rock. Will be doing news/sports updates from 6-9am. Also will produce news/sports for KNIM (Country). My other duties will include covering city council/school board meetings and doing the play by play for Maryville HS. Maryville is about 2 1/2 hours southwest of Des Moines, so I won’t be that far away. It’s also 94 miles away from Kansas City. Oh and the KNIM is a Royals affiliate. Can you say tickets?? The bosses are huge Royals fans. Thank you to all of you for your love and support while I’ve been here in Des Moines. It’s my hometown and I’ll always hold it high. I have a good feeling that the future is bright for this Old Radio Dog. Please think of me/keep me in your prayers during my transition. I have been a Royals fan since I was 9 years old. October of 1980. That was when Kansas City made their 1st ever World Series against the Philadelphia Phillies. I was 2 months away from my 10th birthday. My brother Adam picked the Phillies and I took the Royals. We have been fans ever since. Kansas City lost that series 4 games to 2. The late Tug McGraw struck out Willie Wilson for the final out to give the Phillies their 1st ever World Championship. Fortuantely the Royals would get back 5 years later and be the “comeback kids” in beating Toronto 4 games to 3 and St Louis 4 games to 3 to win their only World Championship to date. They trailed both the ALCS and WS 3-1. I was a freshman in high school at East High School in Des Moines, Iowa when KC became the KINGS of MLB. Never in my wildest dreams did I think that would be their last playoff appearance to date. The Royals were the class of the old AL West back in the day. Winning division titles in 76, 77, 78, 80, 84 and 85. I’m writing this blog because KC beat the Indians Monday night in Cleveland 2-1. They are currently 34-34. Right now my Royals are in the middle of a hot streak to get back to the 500 mark. They have not been 500 this late in the season since 2003 and it’s just the third time since 1994. After suffering through a 4-19 mark in May to drop to 23-32, KC has rattled off 11 wins in their last 13 games to get back even. An impressive run. The pitching has been outstanding. They are #1 in the AL in ERA at 3.35. Their bullpen is also #1 at 2.63. The pen has allowed just 2 earned runs in their last 35.2 innings. The pitching staff has also rattled off allowing 3 runs or less in 15 of their last 16 games. They are 12-4 in that stretch. Dayton Moore went out and got James Shields from the Rays in the offseason. As part of the deal, KC let their best prospect go. Wil Myers. I admit at first blink I was a bit upset. But the Royals made a bold move and played to win NOW. KC has had a stocked minor league system for last few years and has had nothing to show for it. So I applauded Mr Moore for pulling that trigger. Despite is 2-6 record, Shields has been brilliant. His ERA is 2.72. 95 strikeouts to 30 walks in 106 innings. His WHIP (Walks/Hits per innings pitched) is 1.12. He is a gamer and I am glad he throws for my team. The offense has struggled and continues to find their way. But they seem lately to have the knack to score late pull things out of the fire. Again the pitching is to thank for that. Ervin Santana came over from the Angels in a trade and has also been outstanding (5-5, 2.74 71 K 13 BB 92 IP). Throw in Jeremy Guthrie (7-4 3.72) and Luis Mendoza (2-3 4.23) and KC has a very solid 1-4 punch. June ERA to date: 1.75. That is #1 in MLB. It’s been a tough but fun climb to get back to the 500 mark. Here’s hoping the Royals can make a run to the playoffs this year. They trail the first place Tigers by just 5 games. 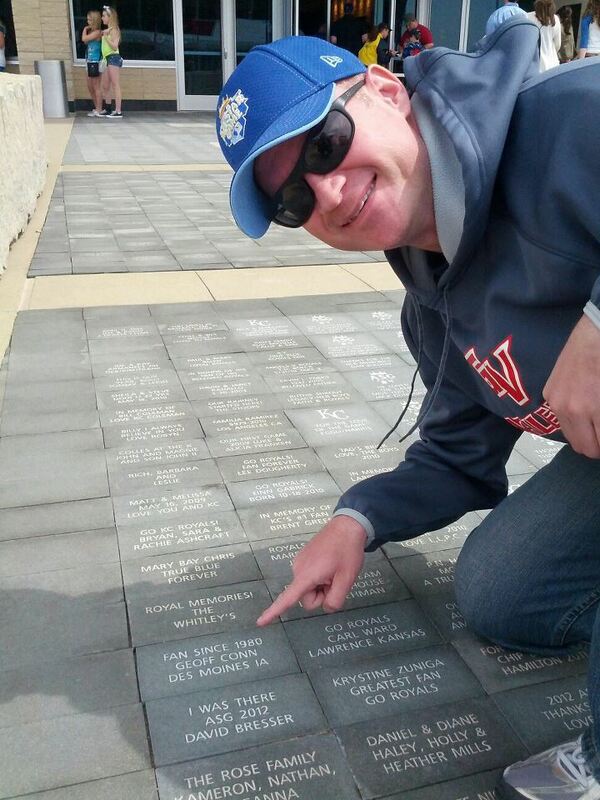 (This is me pointing to the “Royals Legacy Brick” I purchased last offseason that is permanently at Kauffman Stadium- Yeah I Am a true BLUE fan). Some of you may look at the title of this blog and say…”So What?” At first blink, I can understand that. But my nephew Malachi will always have a special place in my heart not just because he’s a blood relative, but because of how he came to be born. For those who don’t follow me closely, Malachi was born June 7th, 2012 pre-maturely at just 2.2 pounds. It’s truly a blessing from God how much he has grown up in a short 12 months. I sometimes cry pretty loosely when I speak or write about him. I’ll always remember the first time I visited him in the hospital after he was born. Tubes all in his tiny body and protected from the outside air in his incubator. We all gathered at Eva’s brother and sister in law’s house in Bettendorf, IA Saturday for his big one year party. (The day after Malachi’s actual birthday on Friday). 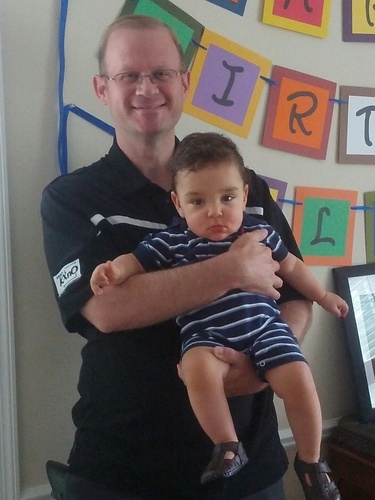 As you can imagine, it was “Pass Malachi around day.” An enjoyable, festive time to celebrate one year of a little guy we’ve all come to love and pull for. We grilled out some burgers/brats, had the traditional sing of “Happy Birthday Malachi,” and all sat around and opened gifts/presents for the little man. He’s made lots of progress in recent weeks. Starting to crawl and now can even stand on his own a bit. He’ll be walking very soon I am sure. Looking forward to being an active uncle, Malachi.